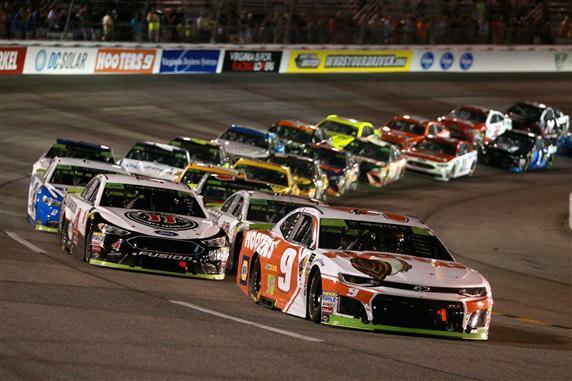 NASCAR will be back to racing under the lights this week at Richmond Raceway. The MENCS will compete in their first Saturday night race and that usually means shinny cars, fast speeds and a lot of action. The Toyota Owners 400 can be seen Saturday at 7:30 p.m. ET on Fox. It will be a compressed schedule for the MENCS this week. The first practice will be Friday at 11 a.m. ET. Final practice is Friday at 1 p.m. ET. No TV coverage for any practice this week. Qualifying will be Friday at 5:30 p.m. ET (FS1). My Garage Talk Notes will be posted Friday after the final practice but they will be limited this week because of the lack of coverage for practice. The “Big Three” dominated the night race at Richmond last September. Martin Truex Jr. qualified 3rd, won both stages, led 163 laps and finished 3rd. Kevin Harvick won the pole, led 40 laps and finished 2nd. In the end it was the “Kyle Busch Show” (Sound familiar?). Busch qualified 11th, did not score any stage points, but he made it to the front when the pay window was open. Busch led 92 laps and took home his 6th trophy at Richmond. Two teams have dominated the races this season and the same two teams have dominated at Richmond. Joe Gibbs Racing and Team Penske have won all of the races in 2019. They have also won 9 of the last 11 races at Richmond. I plan to use many of the drivers from these two teams this week. Short track racing means dominators, dominators, dominators!! There are 400 laps in the race Saturday night. That means there are 100 points available for laps led and 200 points for fastest laps. That is 300 dominator points. The trend at Richmond is to have two main dominators and two sub-dominators. The first dominator leads 160 laps and scores 54 fastest laps (67 bonus points). The second main dominator leads 100 laps and scores 36 fastest laps (43 bonus points). The two sub-dominators lead between 40-60 laps and score around 34 fastest laps (roughly 30 bonus points). We need at least two of these dominators in our lineups Saturday night. I will post my final DraftKings picks no later than Saturday morning. The Fantasy Live picks got off to a hot start to the season but have really cooled off during the last two races. I know what the problem is and I plan to fix it. I have been leaning too much on practice times and the practice speeds have not translated into race speed this season with the new aero package. It is better to simply use the drivers who have the momentum in 2019. The same drivers keep finishing up front so I plan to use them until something changes. *Pick for the Pole*: Our pick for the pole needs to be in before qualifying at 5:30 p.m. ET Friday. My pole pick will be posted after the final practice Friday (2 p.m. ET). Kyle Busch (6): Busch is having a historic season. He has won 3 of the 8 races, has finished every race in the top 10, led 498 laps and has a 3.4 average finishing position. I do not care about allocations when a driver is on a hot streak like this. You have to use Busch at a track where he has 6 wins, including 2 in a row and has finished 77% of his races at Richmond in the top 10. I know it gets boring watching Busch win each week but I doubt it is going to change any time soon. I will use another allocation with Rowdy at Richmond. (I just hope he shaves that ugly beard soon). Martin Truex Jr. (8): Richmond is one of the best tracks for Truex Jr. He has led at least 120 laps in 3 of the last 4 races at Richmond. He has also scored Stage points 7 of the 8 Stages. He swept the Stages in the last night race at the track. Truex had one of his best runs at Phoenix (similar track to Richmond). Truex finished 2nd in the desert and he should score a lot of Stage points and finish up front in the Toyota Owner’s 400. Denny Hamlin (7): If Kyle Busch was not winning so many races this season; Hamlin would be the hot topic in the sport. After a poor 2018 season, Hamlin has really bounced back. He has 2 wins, finished every race in the top 11 and has a 5.6 average finishing position (2nd only to Kyle Busch). Now he will compete in his home state where he has the 2nd most wins (3) and led the 2nd most laps (1,659). I will use another allocation with the No. 11 car Saturday night. Joey Logano (5): Logano started off the season on fire and then had back-to-back finishes outside the top 15 (Martinsville and Texas). I had Logano scheduled for a start at Richmond before the season started but I wanted to see him build some momentum before I added him to my team. Logano finished 3rd at Bristol and led 146 laps. That is good enough for me. Richmond ranks as the 3rd best track for Logano. He has a series-high 5.25 average finishing position and led the 4th most laps at the track over the last two seasons. Logano should be a serious threat to win this week. Brad Keselowski (7): Keselowski has been one of the most consistent drivers at Richmond. He has finished 10 of his last 11 races at the track in the top 11. That includes a 7.5 average finishing position since 2013 (11 races). Keselowski has been good at scoring Stage points too at this track. He has scored Stage points in 6 of the 8 Stages over the last 2 seasons. Keselowski should run up front, score Stage points and finish in the top 5 Saturday night. My Garage Driver this week will likely be Kurt Busch (9). Busch is having a great season. He has sucked in qualifying (20.1 average starting position), but has been awesome once the green flag is waived (8.6 average finishing position). If Busch can ever qualify up front he could turn his top-10 finishes into wins. Busch runs well at Richmond. He has 9.1 average finishing position in the last 9 races at the track. He should easily finish in the top 10 again Saturday night. Busch will be a good insurance policy to have in the garage. *Stats from Driveraverages.com, Racing-Reference.Info and NASCAR Media.